As summer break ended and students from the Center for Emerging Media Design & Development (EMDD) at Ball State are back on campus for the fall semester, we have resumed design and development for the Professor Garfield Digital Literacy website project and picked back up after attending the 2017 International Society of Technology and Education (ISTE) conference in late June. An overview of the team’s work at ISTE follows along with the PGF project agenda for this semester. Ball State University’s Center for Emerging Media Design and Development (EMDD) and the Professor Garfield Foundation (PGF) have collaborated to integrate components of digital literacy into the existing professor garfield resources for teachers. 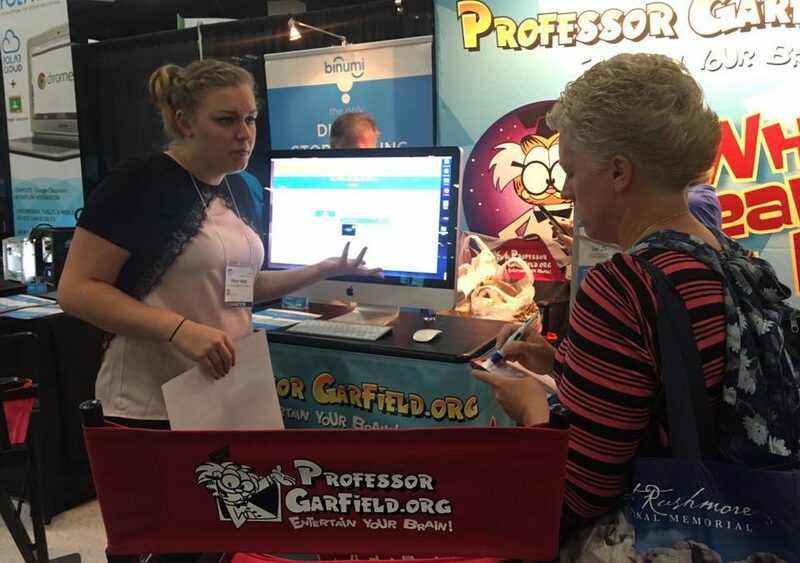 The addition of digital literacy activities extend the mission of Professor Garfield by introducing new skills relevant to 21st century learners and maintaining the organization’s role as a leader in the free delivery of innovative and motivational digital learning content for children’s literacy and creative expression. With a focus on K-3 instructional design and teacher collaboration, this new site intends to support K-3 educators in their lesson planning and delivery of digital technology in their classrooms. Two graduate students from the Center of EMDD attended the 2017 International Society of Technology and Education (ISTE) conference as exhibitors to promote and engage educators in the new resource being offered in Spring 2018. After two days of the exhibition, 75 teachers were recruited as beta testers to continue the website’s development. Each teacher’s contribution to the project will provide insights on the challenges that may inhibit teachers and students from using the site effectively. The Center for EMDD and the Professor Garfield Foundation hope to continue the recruitment of beta testers for the new Professor Garfield website to successfully capture its limitations and refine its usability for elementary students and teachers. The PGF project team agenda includes developing prototypes of teacher resources pages, exploring options for a discussion board for teachers, collaborating on the building of existing digital literacy exercises and updating the pgfdigitalliteracy.com website weekly. The teacher resource pages entail educating teachers about digital literacy, resources for teachers to use PGF in the classroom such as a designed lesson structure and curricular framework for the “PGF digital literacy unit”, and resources for teachers who have little access to technology. The pgfdigitalliteracy.com website weekly updates include news blog posts on the status of the project, information highlights of digital literacy stories and events that the project team attends.